Up until a few years ago, my grandparents had gorgeous mirabelle tree in their backyard. Every summer that tree would carry so many of those small, plum-like fruits that my granddad would bring us buckets full. The memory of those fruits, sweet and tart at the same time, grown in one of my favourite places on earth, will always bring a smile to my face. 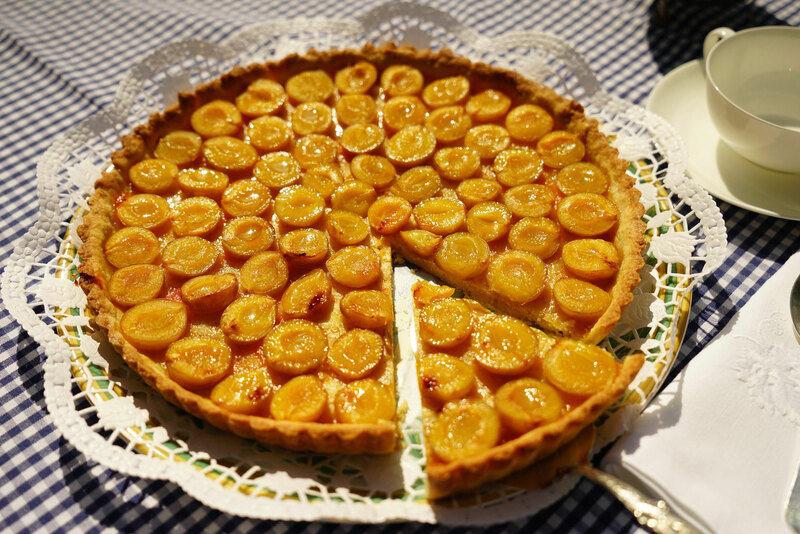 One of the best things you can do with mirabelles is bake a mirabelle tart. The fruits, slightly caramellized on top, go so well with the crumbly shortbread crust. Add a tablespoon of whipped cream on top and you'll be in heaven, I promise. I cannot remember one single event where there were any leftovers of this cake, although I must admit that I always save the last piece of me. I did all the (not at all) hard work, after all! 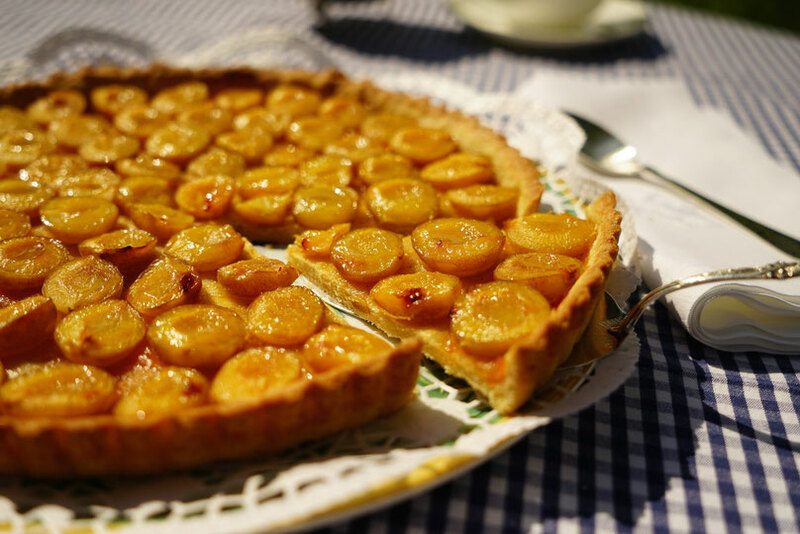 This tart is very easy to make; the dough for the crust just takes some time to rest but other than this it a quick and easy recipes. Of course you can prepare the dough the day before baking the actual tart. These days I have to buy my mirabelles at the farmers market, and even though their origin is unknown to me, they taste wonderful and make every summer day a little bit sweeter. For the crust, add the flour, 50 g of the sugar, the salt, the egg yolk and the cold butter to a bowl and mix it with an electric hand mixer first, then use your hands to create a ball of dough. If the dough doesn't come together (i.e. the mixture is too dry) add some water. Wrap the ball of dough in some clear plastic wrap and refrigerate for about 1-2 hours or overnight. When you're ready to make the tart, take out the dough and let it come to room temperature, so it's easier to work with. Wash, half and depit the mirabelles. Heat the jam over low heat on the stove. Roll out the dough between to layers of plastic wrap, so nothing sticks to the board or the rolling pin. The circumference of the rolled out dough should be slightly bigger than the circumference of the pan. Take off the upper layer of the plastic wrap, pick up the dough, turn it upside down and put in in the springform pan. Then take off the other layer of the plastic wrap. Create a border with the dough of about 1 cm high and prick the base of the pan evenly with a fork, so the dough will not rise while being baked. Spread the warm jam on the base and arrange the mirabelle halves evenly on the dough. Start on the outside and work your way inside. Sprinkle the mirabelles with the remaining sugar. Bake the tart for about 25 minutes, or until the edge is golden brown. Let it cool for about 20 minutes and take it out of the springform pan. This tart tastes cold just as good as warm.